Real Presence in the Blessed Sacrament. Our Lord and Our Lady requested that a medal be made and worn by the children of Divine Innocence. It was to be the size of the host the people receive at Holy Communion and to be called the Eucharistic Medal. Our Lady said this was a gift from heaven. Those who wear this medal openly witness to their faith in the Real Presence of Jesus in the Blessed Sacrament. The Medal represents the Blood of the Divine Lamb, and is a sign of our love for the Eucharistic Jesus. 28th July 1986. Saying the Rosary. Our Lady. My children, I give you my Motherly blessing. What joy, what joy! Soon, my children will wear this medal all over the world. Patricia. Our Lady wore the medal. She lifted it up and kissed it. The Infant Jesus had the medal and chain in His hand and held it up, smiling and happy. Our Lady. 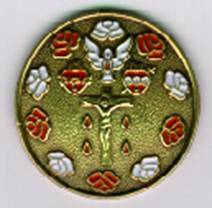 Children of the Eucharistic Hearts of Jesus and Mary, wear this medal as a sign of love. Do you love the Hearts of Jesus, your Saviour, and your Heavenly Mother? Those who wear this medal will be drawn deep into the Hearts of Jesus and Mary. Those who kiss it and make an act of adoration towards my Son in the Blessed Sacrament will receive the joyful blessing of heaven. In them will grow a deep desire for the Blessed Sacrament. Everywhere secret adorers will grow in number. This medal will be a sign of Divine Innocence born and growing in your hearts. Infant Jesus. The wearing of this medal will remind souls of My Divine Innocence which I wish to see grow to maturity in them, until they can bear all for their brothers and sisters. Meditate on the symbols here; do not just wear it and forget it. Let it remind you of Hearts burning with love for you. Let it remind you to desire the gifts and fruits of the Holy Spirit. Place yourselves and those you love and are concerned about in the Eucharistic Hearts. Let it remind you of purity and childlike innocence, of the Hail Mary's of the Rosary, the Ten Commandments of God, My Blood poured out for you. Most of all, let it remind you that Divine Innocence awaits you here on earth, in the Tabernacle, silently longing for your company. No! I am not a symbol of God’s Presence among you, I am the Real Presence of the living God, bearing all for you, longing to pour out gifts of love, peace and humility. All the divine virtues are yours, you only have to ask to receive! The medal is the size of the Host to remind you of My Presence and of My Love and concern for all men. Come to the Mountain of the Lord as brothers! Patricia. We have been asked to wear the Eucharistic Medal openly. Our Lady. See this circle! This represents God the Father who has no beginning and no end. Your God (One God, three Divine Persons), who was, who is and who always will be. This Medal represents God’s Real Presence in the Eucharist, God’s longing to feed you with His Very Self (in Holy Communion). See this Cross on which the Innocent One died! His Blood poured out for those He loves (every soul ever created or to be created). This is the generosity of a true friend who gives His life for His friends and enemies alike. See this Heart (the Sacred Heart of Jesus)! Surrounded by the thorns of bitter suffering, hurt again and again by the sins of the world yet burning with love for souls. See this gold sphere! This is you, if you place yourself in His Heart, purified like gold in a furnace of Love. See this Motherly Heart (the Immaculate Heart of Our Lady)! Here you see God’s Motherly Love for His people. The sword that pierces the heart of so many mothers, who are deeply concerned for their children’s fate, pierces the heart of your Heavenly Mother in her deep concern for God’s children. Place yourselves in My Heart (the second gold sphere, in the Heart of Our Lady). Here, your heart will learn to beat in union with the Heart of the Creator and be purified with tender Motherly Love. Here you will learn all the virtues God desires to see in you. In union with the Eucharistic Hearts of Jesus and Mary, you will grow in love and holiness. See the symbol of the Holy Spirit of God (the Dove) – the Third Person of the Blessed Trinity, who moves in freedom among God’s people! See the gold chain with the single drop of blood! This signifies that one drop of the Innocent Saviour’s Blood was sufficient to save the whole world, but God wished to go to the extent of (what seems to be) foolish generosity by pouring out His life for love of you. See these roses representing the Ten Commandments of God! Say the Ten Hail Mary’s in each decade of the Holy Rosary in honour of God’s Commandments which He has given to His people. Five of the roses are red and represent the Five Wounds of Christ Crucified, and His Death. Five of the roses are white and represent the Five Mystical Wounds of your Heavenly Mother, the roses of purity and chaste love, to remind you that purity is the flower from which all the other virtues spring. The size of the Medal is the size of the sacred Host to remind you of God’s desire to feed you with the Bread of Heaven, His Very Self. Wear the Medal and remember Him – alone and often unloved in the Tabernacle, waiting for you to come to Him to pour out His Love and Spirit on you, to fill your heart with joy and your mind with His Wisdom. Remember Him often during the day and make a Spiritual Communion with your God. Let this be a sign to those who wear this Medal that they are the Children of Divine Innocence, Peace and Love! Jesus. The Children of Divine Innocence will wear this Medal in honour of God’s Presence here on earth among you.